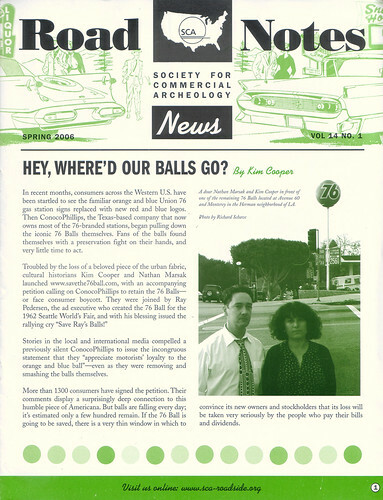 When I wrote this little text about our campaign for the preservation journal of the SCA some months back, I didn’t think they were going to put it on the cover of Road Notes! I also didn’t think the Hermon ball, beloved by Nathan and myself and featured in the photo we sent along, would be GONE by the time it was printed. But so it is. Walking west on the Sunset Strip last night, I saw a terrible sight, perhaps an omen. A handsome backlit 76 ball on the North side of the street between Fairfax and Crescent Heights was suddenly shut off as my friends and I were enjoying it. It was as if the very sun had gone out. Save the 76 Ball. It’s not too late. More Hawaiian 76 Balls in Motion	Banned in Leisure World? A nice 76 ball turns here…at least it did the last time I went through…5/31/6. Hope to still see it when I go back next week. Glad to hear that a campaign to save these things has started. Thanks greatly to all of you for reading this. This is that rural-Alabama-based, commercial-artist, studio-artist, plastic-sign collector, and Christian, soc. work-volunteer…who had asked where one can find a “Union 76“ wall-mounted disc from 1960s. Well, my photos are ready! We finally developed some snapshots which include an ultra-rare, Plexiglas, Pure Oil sign in my collection. Two other photos: One of this town’s five collectors of pop-culture Americana (including yours truly) has a pair of 72-in. (or 90 in.?) 76 “contact lenses” for sale, both still attached to the giant frame. Yes, I’ve read the steps that you must take, in order to save your photos (illustrations, cartoons, graphic-designs, &c.), as well as (what you must do in order) to E-mail them. But I’m still a computer “dunce”; I’m still very, VERY new at this. 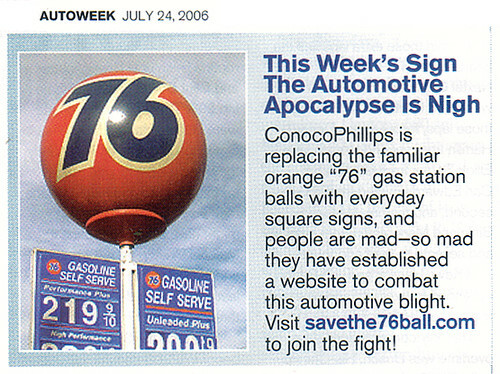 I do plan to develop a sample cartoon, about ChevronTexaco‘s decisions over all these “76 balls,” west of the Rockies. I do plan this as a sample of a comic-strip which I’ve developed (for antiques-collectors‘ magazines) for some eight years. Until I find the time, however: If only you could see those snapshots that I saved, two weeks ago! Two old Pure Oil/Unocal country-stores (yes, with their old signs)…a third, Unocal country-store in my own county…and at least three old, Pure Oil “cottages” within N. Mississippi. (And one of these, in Tunica, Miss., might have Pure-branded pumps again, in 2006!) Since Pure Oil‘s headquarters had once been in Columbus (Ohio) and Palatine, Ill., my snapshots might be of interest to Indiana-based, “76” collectors–such as that guy who asked other, Indy-based collectors to contact through this blog-site. What especially discourages me, about being unable to E-mail visuals: The HOURS I spent just organizing my snapshots and their envelopes! Yes, these include my abandoned-country-store snapshots, along with envelopes labelled (sic) according to regions of Ala. and/or other states (snapshots which I use for my own canvasses & watercolors). But I also organized my other photos and labeled their envelopes accordingly: family-snapshots, photos of my own works, collectibles (for insurance purposes), “junk” for sale or trade, &c., &c. If you spent as many hours away from your work–you’d become discouraged, also. Fremont street in Monterey has two 76 stations, both of which still have their 76 balls. Neither of them have ever actually spun around like the one on Forest Avenue in Pacific Grove, but they’ve remained at their locations, even with the rest of the two stations adopting the new ‘red’ look, for about twenty years or more now.